We're off to Venlo today. If traffic cooperates it is approximately a 2 1/2 hour ride. But we'll take all day. How come? Because we'll make a couple of stops, you silly thing. If there are gardens along the way (more or less, along the way that is) why ever wouldn't we. Our first stop: the Palais Het Loo, in Apeldoorn. Some background history: When Prince Willem III of Orange-Nassau was named Stadtholder of Gelderland in 1672, he received the hunting rights to the Veluwe. 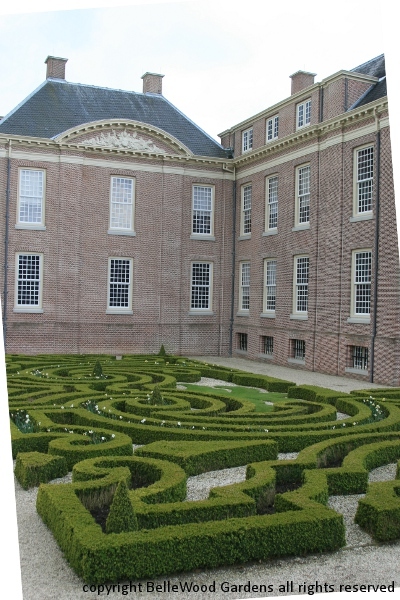 First a house was adapted for use as a hunting lodge, and then in November 1684 he bought the castle Het Loo. Covering 650 hectares of parkland and 11,000 hectares of forest and countryside, there was ample space to construct a country palace and hunting seat for Willem III and his wife, Mary II, a Stuart. Invading England in November 1688, he won the crown of England, Ireland, and Scotland. From 1689 he reigned as William III over England and Ireland, and in Scotland as William II. There's more information here. At Het Loo, as with other 17th- and early 18th- century formal gardens (think of the better known landscaping of the palace gardens at Versailles by Le Nôtre at a slightly later period, 1699 - 1710) it was expected that there would be a harmonious interplay of plants, shrubs, water features, statuary, and architectural elements. Nature, but nature controlled by the hand of man. 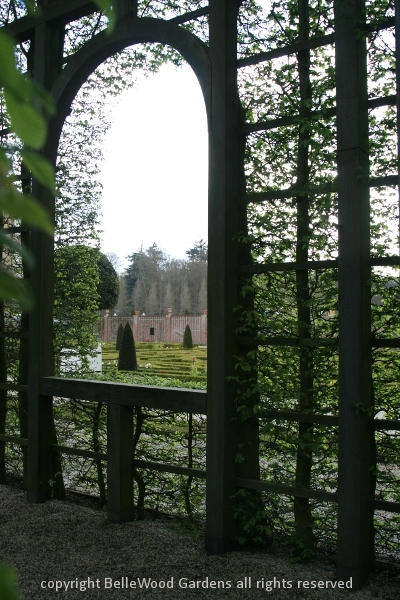 Parterres, low boxwood hedges, formed elaborate, symmetrical patterns with the space between covered with gravel and carefully selected plants. 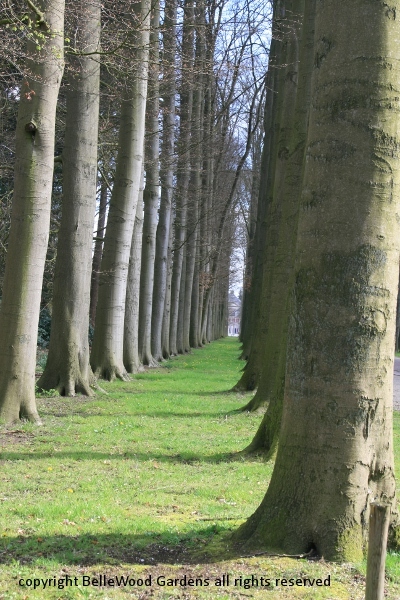 creating a paired allée to either side. Glimpse the palace beyond. 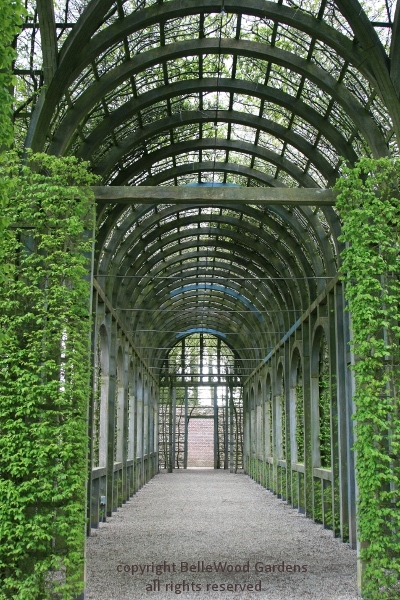 The gardens are reached from the lower level of the palace through a passage under the terrace. 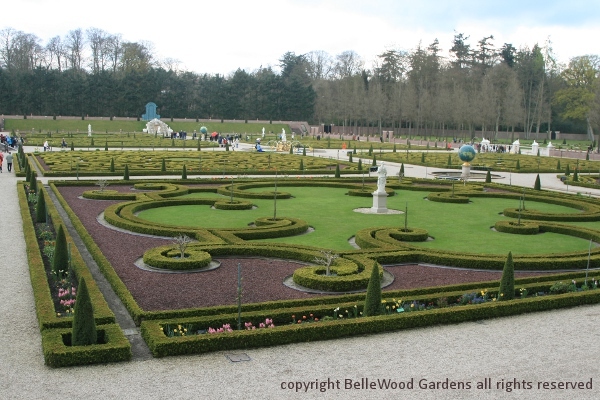 A view of the main garden, showing the somewhat severe geometry of the design, symmetry of boxwood hedges and parterres, exquisite statuary and water features. There are eight square parterres, in a double row of four pairs. 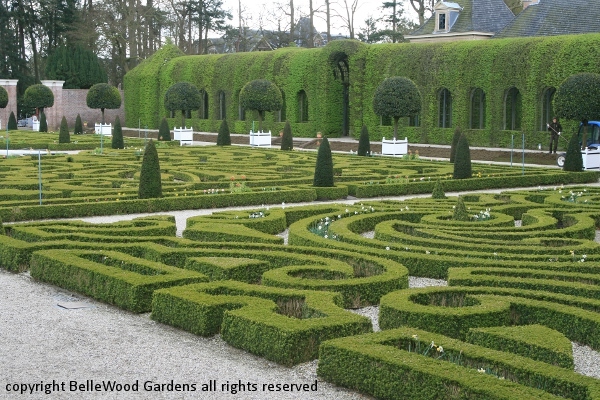 The inner four are parterres de broideries with elaborate embroidered designs while the outer four are green parterres, closely clipped turf edged with tidy boxwood hedges, very neat. 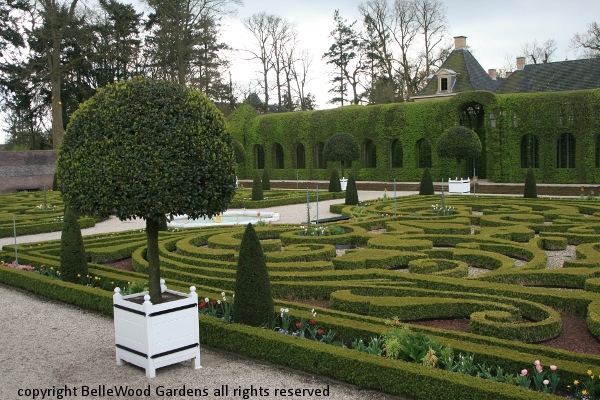 All the parterres are bordered by plates-bandes, narrow beds of flowering plants and pyramids of trimmed yew and juniper between more boxwood hedges. the ladies with a sheltered cloister where they could walk and enjoy the gardens out of the sun. and more settled it will be orange and lemon trees. Today, there are numerous bay laurel. Inside the berceau, an inviting walkway suggests a quiet stroll. From within the berceau a view out into the garden. 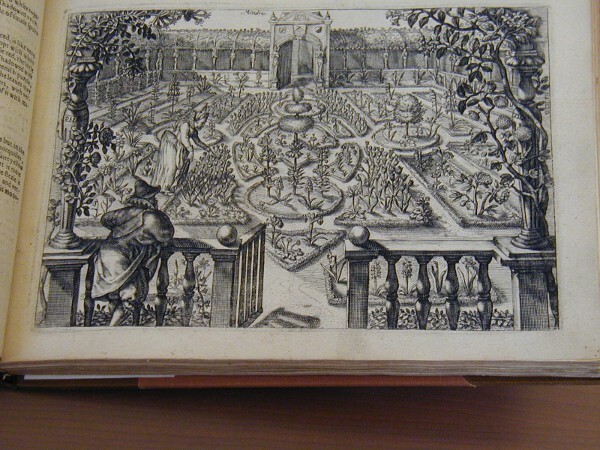 Frontispiece from Hortus Floridus by Crispijn van de Passe the younger, published in 1614.
daffodils, and crown imperial, while a luxurious berceau encloses three sides of the garden. The Queen's Garden, sheltered by the palace walls and overlooked by her apartments. 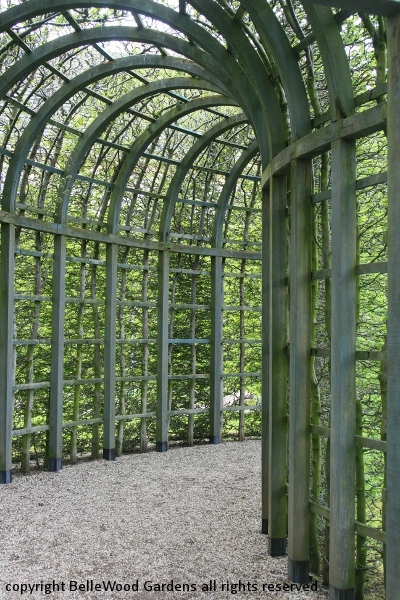 style of garden was well established, as it originated in 15th-century French gardens. 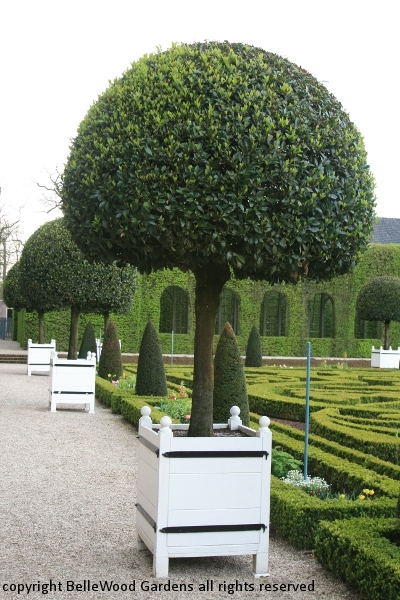 time were appearing in the 17th-century baroque garden à la française, or knot gardens. The King's Garden or Upper Garden features a spectacular fountain spouting water more than 40 feet into the air. When it was originally built the water came from miles away in Asselt and Orden, sites especially purchased for their high ground that would provide the pressure to power the water jets. 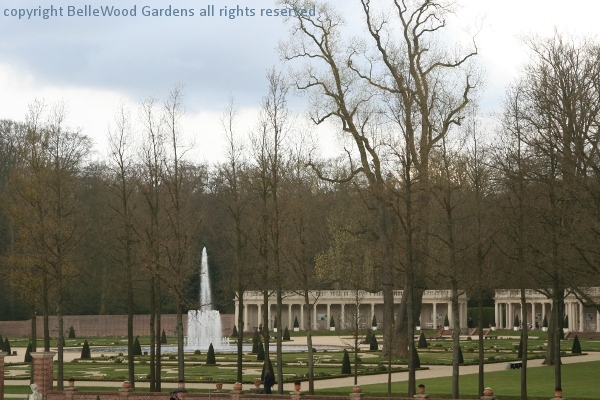 The water table has since lowered, and today the water features at Het Loo are a closed system. Tour Comments: It drizzled. The weather even spat some small hail at us. 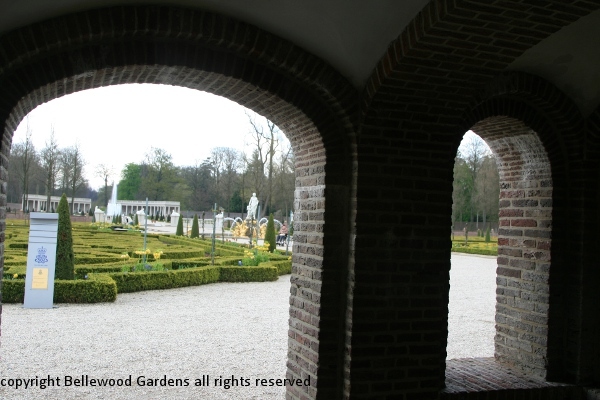 Who cares, we're here at Het Loo, transported back in time to the days when royal gardens were, well, royal.